Removes all make-up even waterproof. Ultra-efficient. Protects eyelashes. No rubbing required. No greasy feel, gentle on the eyes. 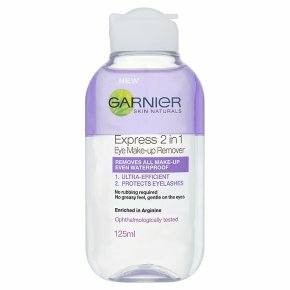 Ophthalmologically tested.Is Garnier 2 in 1 express eye make-up remover right for me? Yes, if you are looking for an eye make-up remover that can easily remove make-up, even waterproof, while protecting and caring for your eyelashes. How is it different? A two phased double action formula: 1. Ultra-efficient. It removes eye make-up perfectly, even waterproof, while leaving no greasy feel or residue. 2. Protects eyelashes in 4 weeks. Enriched with naturally derived Arginine, Express 2 in 1 Eye Make-Up Remover leaves a protective layer on your eyelashes. Without rubbing, they feel perfectly cleansed and cared for. Result: visibly less eyelashes on the cotton pad. How to use it? Shake the bottle: the two phases mix perfectly. Apply a few drops to a cotton pad and hold against your eyes for a few seconds to allow make-up to dissolve. Then, gently wipe away, starting at the inner corner of the eye moving outwards, without rubbing. This formula is suitable for those wearing contact lenses.